The midterm elections are coming up, and some local progressives have put together an event at Midlands beer garden to help elect a Democratic candidate in an upcoming special election in Ohio. The event is on Tuesday, where you can help write postcards to local Democrats reminding them to get out and vote. The event is 6-10pm on Tuesday, and there is buy one-get one free beer until 7 pm. In case you need a reminder, Congressional elections are important for the country of course, but also to DC, as Congress controls DC's budget and has the power to block things that local voters have supported -- in the past they've blocked medical marijuana, reproductive rights, and a lot more. Here's more info from the organizers. Midlands is at 3333 Georgia Avenue NW. In light of yesterday’s news about Justice Kennedy's retirement from the Supreme Court, it is more urgent than ever that we all work together to support Democratic candidates in the upcoming Midterm Elections. To meet this goal, we are inviting you to our first Midterm Postcard Writing Party, organized by a small, concerned group of neighborhood friends, and graciously hosted by the Midlands Beer Garden, on Tuesday, July 3rd at 6pm. We know folks are looking for ways to get involved, and this is a great, low-commitment way of doing so. Did I mention there is BOGO free beer until 7pm? The Facebook invite is here: https://www.facebook.com/events/2034569706760746/?ti=ia. If you could please RSVP so we can get a headcount for the Midlands we would appreciate it. Please feel free to share the invite! This first night, we will be writing postcards in support of an August Congressional Special Election in Ohio. Polling shows the candidates are within 2 points of each other, and this is in a district where Donald Trump won by 12 points. We will be writing to Democrats to remind them of the election and to encourage them to get out and vote. This will be the first of what we hope to be a regular event, so if you can't make it this week, please note your interest on the Facebook invite, and stay tuned for the next invite. Good stuff -- two different readers spotted hilarious signs at 14th and Kenyon: they look like missing cat signs, but it turns out they're just talking about how fat these cats are. And there are pull tabs for "THICC" instead of the phone number. The small text reads "I don't need you to do anything about it, I just wanted to see how they have gotten, WOW! Their names are Jack and Olive and they are very very chubby now! Don't shame them! They are still good cats! MEWOW THOUGH!" Good stuff. Thank you to whoever posted them. This is a scary story: a friend of a friend was riding a Capital Bikeshare down 13th Street Monday morning around 8:30am -- and then he woke up in an ambulance after a crash. The police report filed about the incident says he was apparently hit by a car and found around 13th and W. Did you happen to see what happened there or know anyone who might have? According to the 911 call, EMS was on the scene and picked him up before police even arrived, so their evidence at the scene is minimal. It seems like some kind person called 911 and perhaps the same, or another, person used a rag to help his bleeding as it's part of the EMS bag of personal effects and not actually his. Anyone catch a glimpse of any of this? Anyone know anyone in the area that might have surveillance footage? He's filing all the necessary reports, including with WABA, but any other advice would be much appreciated! He is in good spirits with no broken bones thankfully, but a lot cuts, scrapes and bruises. Here's him at the hospital on Monday with supportive friends. Good news for fans of Ethiopian food, and hopefully a tenant for a long-vacant space: there's an Ethiopian restaurant coming to 3630 Georgia Avenue NW, the storefront between DC Reynolds and what used to be Walter's Sports Bar. The space had been Gena's Beauty Salon but it's been vacant for some time. I saw a permit in the window and contacted the building owner, who said it would be an Ethiopian restaurant and put me in touch with the proprietor of that restaurant. However, they didn't respond to emails, so I don't have too many more details. The permit was issued in early June, so it may be some time before the restaurant opens. I'll keep looking for more details. My name is Loi Baker, I am a virgo who enjoys great food, good music and good books! I am fun-Ioving and enjoy spending quality time with friends and famliy. I was born in Jamaica and moved to DC five years ago. I have been a vegetarian for over ten years and one of my passion is creating and preparing mouthwatering vegan/vegetarian meals. I am now looking to transform my passion by starting a vegan restaurant by November, 2017. Sweet-Sosumba Jamaican Vegan Cafe will serve a classic vegan cuisine that features a distinct Jamaican flavor. Sweet-Sosumba Vegan Cafe will be a cozy, creative green space where socially conscious community members and others can gather around tasty meat-free meals. Growing numbers of people are choosing vegan/vegetarian meal options for better health, for the earth and for the animals. Sweet-Sosumba Jamaican Vegan Cafe will be satisfying this shift in consumer taste preferences by offering healthier non-meat meal options. 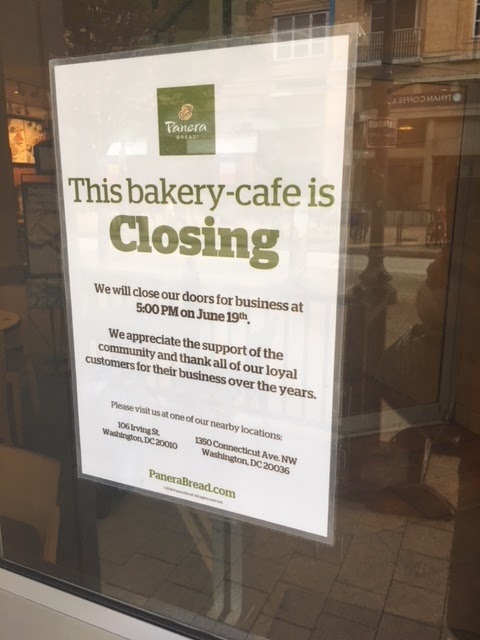 A reader just sent me this -- Panera on Irving is closing. I liked it pretty well, but it never seemed too crowded. I'd be interested in seeing what's coming next. There are a lot of changes afoot at DCUSA, I'll write a post about that shortly. This is directly across the street from the incoming Wawa. 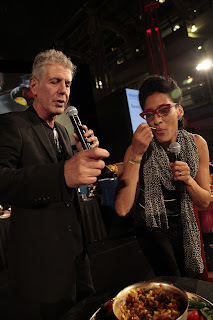 Anthony Bourdain, the beloved chef and writer, visited many places around the world through his career with No Reservations, Parts Unknown, A Cook's Tour, The Layover and more -- and in 2009, he came to DC for No Reservations, where among other things he visited Ben's Chili Bowl, the Maine Avenue fish market, and hung out with Jose Andres. He chatted with the owners of Ben's, among others. As always, he had a thoughtful take on Ben's and the city, and also ate at Vietnamese and Ethiopian restaurants around town. You can watch the episode below, Ben's Chili Bowl is the first segment. Bourdain also visited DC other times outside of his TV show, helping with fundraisers for DC Central Kitchen and giving a talk at DAR Constitution Hall. He will be missed. Here's the direct link. Photo by DC Central Kitchen. 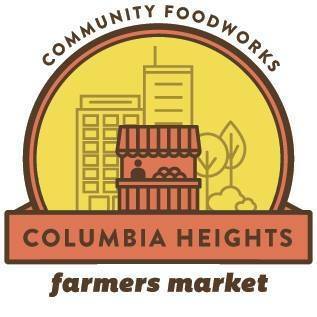 If you like food fresh from the farm, you now have two options for the Columbia Heights Farmers Market: they're open on the Civic Plaza on Wednesdays from 4pm-7pm and Saturdays from 9am-1pm. The Civic Plaza is the triangular plaza where 14th, Kenyon and Park meet. The market, if you haven't been before, has a wide variety of produce, meat, cheese and dairy, coffee, bread and baked goods, plus some snacks like tacos, popsicles and sandwiches. There's also often music or other entertainment plus arts and crafts vendors too. Worth a stop. There are also markets in Petworth (9th and Upshur), Mt. Pleasant (Mt. Pleasant & 17th) and 14th and U which are all Saturday from 9am-1pm. This is interesting: last year, Ward 4 councilmember Brandon Todd proposed an Office of Nightlife to help with community and nightlife relations. The Post says Todd described it as "a liaison between government, community leaders and business owners to ensure that all residents benefit from the proliferation of bars, restaurants and entertainment venues in the nation's capitol in recent years." Other cities have similar programs, sometimes called a Night Mayor or Night Czar. More recently, the office received some money from the city's budget, and Todd has talking about the idea at events and meetings, so I asked for more information. Here's a few questions the councilmember answered via email. The full bill text is here. What are your goals for it? It seems focused mostly on residential neighbors’ concerns, is that the case? The purpose of the Office of Nightlife and Culture is to serve as a liaison between nighttime economy establishments, residents living near such establishments, and the District government. This includes a variety of responsibilities. The office will serve as a point of contact for establishments to help them connect with District government agencies on everything from consumer complaints, to problems with District government agencies, to obtaining licenses, permits, or approvals. It will also serve as the intermediary when any issues arise between the District government, Advisory Neighborhood Commissioners, residents, and establishments, such as noise, littler, parking, or public safety. The office will also provide input to other agencies on matters important to the nighttime economy, identify and provide information on best practices in the nighttime economy sector, and work with the Commission on Nightlife and Culture (also created by this legislation). The Office of Nightlife and Culture will focus on building a vibrant nighttime economy for the District of Columbia that operates smoothly in the context of each neighborhood. They will serve as a resource to both the community and small businesses for any and all nightlife-related concerns. They will help bring more jobs to the District, and expand opportunities for residents to engage in fun, safe nighttime activities, which is so much more than just bars and clubs, but also restaurants, art, culture, music, and fashion. How does it benefit owners of nightlife businesses and people who go to them? The Office will benefit owners by providing a single point of contact on all matters related to their establishment. The Office will be open during nighttime hours when other Government agencies are not open, and will be able to help with obtaining permits or getting other concerns addressed by DC Government agencies. Patrons will benefit from the office advising establishments on safety and security best practices, including training programs to prevent sexual harassment and assault. What kind of budget would it have? I am delighted to report that we have secured $291,000 in the Fiscal Year 2019 budget for the Office of Nightlife and Culture. The funds will be set aside until the establishing legislation is passed into law. These funds provide for three full time staffers, including a Director, Staff Assistant, and Community Liaison, plus $60,000 to stand up the office. Would it have enforcement abilities or legal authority? No, this office would not have enforcement authority. Those functions would continue to be the responsibility of the respective agency. For example, the Metropolitan Police Department will still be responsible for addressing public safety concerns, the Department of Consumer and Regulatory Affairs will still process building permits, etc… The Office of Nightlife and Culture will just serve as a central liaison between establishments, the community, and the Government. 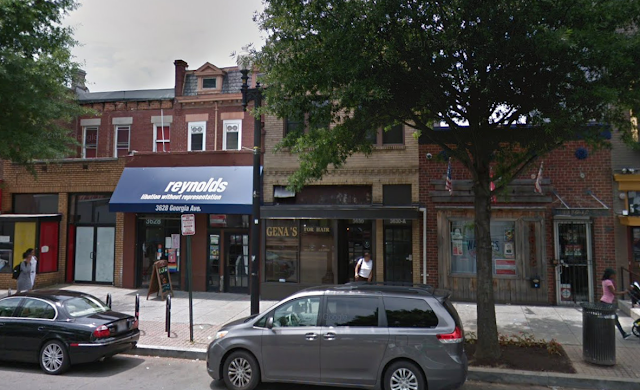 Looks like another spot is soon to open on the 14th Street strip where the Red Derby, Lyman's, Mezcalero and Taqueria Habanero are: Little Havana, a Cuban spot from the owner of Mezcalero and El Sol in Shaw. I walked by the other day and it looks like they are making progress, and Eater has an article taking a peek at the inside and at the menu. The spot has 70 seats split between a dining room in the front and a bar in the back, which chef Joseph Osorio says is a way to have the spot be family friendly but also fun for the late night crowd. Osorio's grandmother is Cuban and he's previously cooked at a lot of Clyde's Restaurant Group kitchens. The food will be Cuban and Cuban-inspired, like a planned Cuban sandwich spring roll. They're also looking at ways to use frozen pineapples as glasses for cocktails. To start they'll be open 4pm-11pm with plans to add brunch on weekends and coffee and pastries in the morning, something sorely needed in that area. 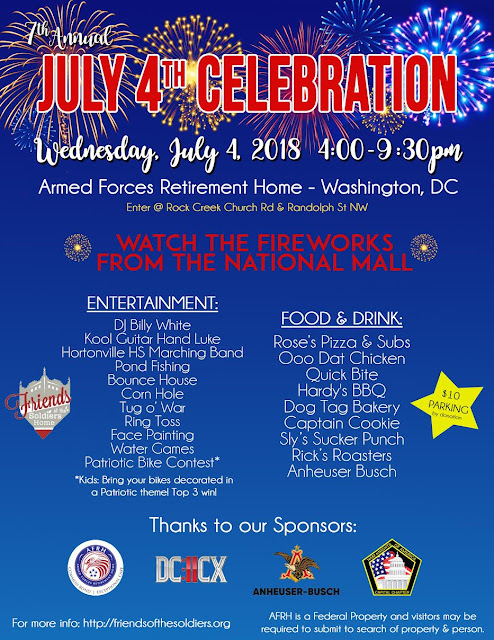 4th of July celebration at the Old Soldiers Home: music, food, beer, kids activities, and watch the fireworks! The annual Fourth of July celebration at the Old Soldiers Home is happening again, and it's a good time. The campus (officially the Armed Forces Retirement Home) is just east of Rock Creek Church Road NW and Park View and a good spot to watch the fireworks on the Mall, as it's on a big hill. It's a beautiful campus too with rolling hills and lots of trees. This year's fest has a lot going on! The event is put on by the Friends of the Soldiers Home and a number of sponsors. Not specifically Columbia Heights-related, but good news for anyone interested in local news: DCist, the long-running news site that was shut down last year by its new owner, is back! WAMU, a local NPR station, bought the site and rehired the previous editors and much of the staff. The closing in November came as a shock to everyone, and happened after New York staff voted to unionize (the parent company, Gothamist, owned a number of local news sites.) The billionaire former owner who closed it, Joe Ricketts, is famously anti-union and basically shut down the entire network to spite them. If you've read DCist before, you're probably pretty happy, and if you haven't, it's definitely worth a look. I basically used to have it open all day to see what's new. If you want to celebrate with staff and friends of the site, there's also an opening party on June 14. They also have a Kickstarter to help it get going. After purchase by WAMU, DCist will begin publishing new content, celebrated with a launch party and aided by a Kickstarter campaign. Three months after WAMU announced the acquisition of beloved neighborhood news site DCist, the station reports that the site will resume publishing content on Monday, June 11 at DCist.com. DCist will continue its tradition of reporting on local District news with the same witty, unique voice it has had since its inception. WAMU and DCist will host a launch party to celebrate DCist’s return, which will feature an interactive art experience, DJs, food trucks, games and more. The party is set for Thursday, June 14 from 6:30-11:00 p.m. at the Blind Whino art space in Southwest D.C. Tickets are on sale at www.wamu.org/events and are $20 each. Attendees must be 21 years old or older. Want to get involved? WAMU launched a Kickstarter campaign to help sustain DCist as an online news outlet and to help bring in freelancers and contributors on a regular basis. The goal is to reach $75,000 between May 22 and June 22. To learn more, visit www.wamu.org/kickstarter. WAMU 88.5 is the NPR station in the nation’s capital and Washington’s source for local and national news, podcasts and smart, thoughtful programming. WAMU produces the nationally acclaimed program 1A, the daily local talk show The Kojo Nnamdi Show, the Diane Rehm: On My Mind podcast and award-winning regional news that spans topics from race and power to business and the arts. WAMU is member-supported, professionally staffed and licensed to American University. Founded in 1961, WAMU reaches an audience of nearly one million listeners on-air, online, and on demand. Learn more about WAMU or listen live atwww.wamu.org. What's your favorite parents group/website/meetup/event in our area? I recently got a good question from a reader who's a new mom: are there any good moms or parents groups in our area? Or how about websites or web forums? I know there's the DC Urban Moms and Dads forum, but I've heard it kind of turns into troll city sometimes, similar to the PoP or WTOP comment sections. There are also a lot of great events for kids and parents at BloomBars on 11th and Walls of Books of 14th. Any other recommendations? Post them below! UPDATE: on our Facebook page, a reader recommended two neighborhood parent listserves: Columbia Heights New Parents and Petworth New Parents. 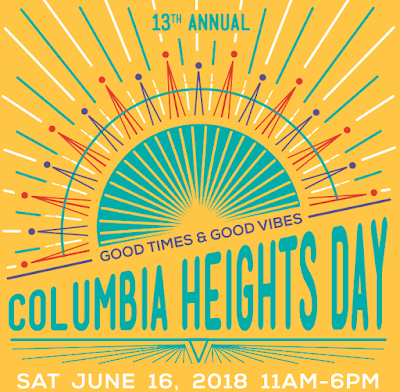 Columbia Heights Day, the annual street festival on 11th Street, is upon us: it's Saturday, June 16th from 11am-6pm. Running from Park Road to Irving Street, the fest will have artisans and vendors, two stages with music, dance and classes, plus a kids carnival at Tubman School and a beer garden for bigger kids. And this is the 13th year! Here's the Facebook invite for the event. If you'd like to be a volunteer, here is the link to sign up: https://goo.gl/forms/FJTDZFMNeL6ztbuw1 -- you'll get a free t-shirt. The best local DC street party is back and you’re invited!! Join us in celebration of our diversity and community, with the neighborhood’s finest food, drink, and entertainment! 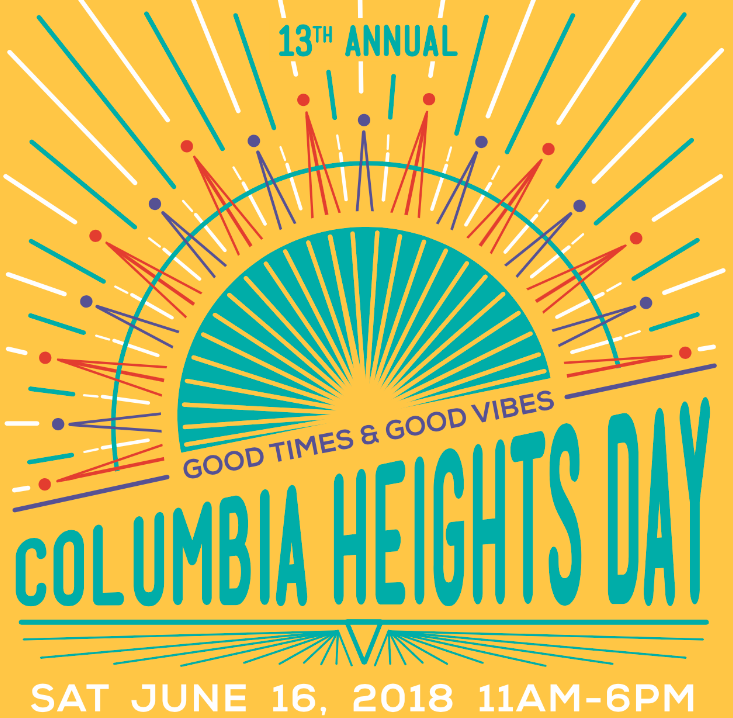 Discover artisans, entrepreneurs, and area businesses in the heart of Columbia Heights. There's fun everywhere and for everyone! 2 stages with live music, dance, and free fitness classes. Kids can play at the carnival on the Harriet Tubman field while adults make their own fun at the Meridian Pint beer garden. See you on Saturday, June 16th! Where: 11th Street between Park Road and Irving Street.